Dairy processing facilities need to control spoilage microorganisms in fluid milk in order to reach markets and increase their profits. The major contributors for early spoilage on fluid milk are sporeforming bacteria capable of growing under refrigeration temperature and Post- Pasteurization Contamination (PPC) organism. Since these two groups of organisms have different survival characteristics, strategies to control them may require different approaches. Therefore, identification of bacteria contributing to spoilage becomes essential. The objective of this research was to identify the spoilage bacteria, mainly sporeformers, associated with laboratory heat-treated milk (80°C for 12 min) and commercially-pasteurized fluid milk, throughout a production chain in Nebraska. Identification was done using the rpoB gene and/or partial 16S rDNA sequences. Raw and pasteurized milk samples were collected from different locations (farm, trucks, processing plant, and packaged products) during three periods (Spring-2012, Fall- 2012 and Spring-2013). All raw and some pasteurized milk samples (Spring-2013) were heat-treated in the laboratory (80°C, 12 minutes) to eliminate vegetative cells allowing the exclusive survival of spores. All milk samples were stored at refrigeration conditions (5 ± 1°C) during 21 days. Bacterial isolates were collected at different shelf-life time points and identified using rpoB and/or 16S rRNA sequencing. A total number of 207 bacterial isolates were identified. The isolates obtained from laboratory heat-treated raw milk samples included Bacillus spp. (84%), Paenibacillus spp. (11%) and other sporeforming bacteria (5%); while the ones from commercially pasteurized milk samples were identified as Bacillus spp. (54%), PPC (29%), Paenibacillus spp. (12%), and other sporeforming bacteria (5%). Although most of the isolates were identified as sporeforming bacteria, PPC is still a concern in commercially pasteurized milk, especially during the filling stage. Psychrotrophic sporeformers were detected in samples from different locations throughout the production chain, thus strategies to control them would need to encompass the entire production chain. In the United States, about 31% of the total milk supply destined for fluid milk is estimated to be lost throughout the milk supply chain [farm, retail and consumers]  , due to spoilage by microorganisms. Pasteurized fluid milk is mainly spoiled by sporeforming bacteria or by psychrotrophic Gram-negative bacteria due to Post-Pasteurization Contamination (PPC) . If both groups of organisms are initially present, PPC will out complete the sporeforming bacteria and they will become the dominant microflora [3,4]. Implementation of improved pasteurization, sanitation and maintenance procedures has greatly reduced PPC in fluid milk, thus, contributing to the extension of milk’s shelf life . However in these improved processing systems, sporeforming bacteria become the microbiological limiting factor to further extend the fluid milk’s shelf life [2,5,6]. Sporeforming bacteria can survive pasteurization and persist in the plant environment by potentially forming biofilms, which can be transferred to pasteurized milk thus reducing its shelf life [2,6]. Pasteurized fluid milk code-dating (i.e., “sell-by”, “code” or “expiration” dates) on milk packages depends on state regulations and processors policies . In the United States, the shelf life of pasteurized milk usually varies between 14 and 21 days [2,3]. The Pasteurized Milk Ordinance (PMO) regulates the production, processing and commercialization of pasteurized milk and other dairy foods produced with Grade “A” milk. At the farm level, the PMO specifies that raw milk from a single producer should have a Standard Plate Count (SPC) of less than 100,000 CFU/mL (5 logs) . Raw milk has to be pasteurized to kill all non-sporeforming human pathogens usually associated with raw milk. This goal is accomplished by heating milk to a minimum of 72°C for at least 15 seconds (High Temperature Short Time – HTST pasteurization) or any equivalent combination of temperature and time. Grade “A” pasteurized milk should have a SPC of <20,000 CFU/mL and a coliform count of ≤ 10 CFU/mL during the product shelf life . Strategies to better control microbial spoilage of pasteurized milk require an assessment of the main microorganisms spoiling this product and their sources throughout the fluid milk chain. Therefore, the objective of this research was to identify spoilage bacteria present in milk samples (laboratory heat-treated and commercially pasteurized) collected along a milk production chain in Nebraska using rpoB and/or partial 16S rDNA sequencing. To gain insight on bacteria causing spoilage in this milk supply chain; a total of 16 raw and 15 commercially pasteurized milk samples were collected in Spring 2012 [S12], Fall 2012 [F12] and Spring 2013 [S13] from a dairy farm and a medium-size fluid milk processing facility in Nebraska, supplied exclusively by this dairy farm. Milk samples were collected from seven sites: [A] sampling port at farm, [B] truck’s tank (outlet valves) at arrival at the processing plant, [C] top of raw milk silo, [D and E] in-line sampling ports right before and after HTST treatment, [F] top of pasteurized milk tanks, and [G] final packaged milk samples right after the filler. A simplified diagram of the collection points is presented in Figure 1. Raw and commercially-pasteurized milk (including skim, 1%, 2%, whole or chocolate) samples were collected. Aseptic samplers (QMI, St. Paul, MN) were installed at sampling points D and E, and milk samples were collected in sterile bags. All samples were placed in coolers containing ice packs and were transported to the laboratory. The processing plant uses the High Temperature Short Time (HTST) pasteurization process, thus milk was pasteurized at a temperature above 79°C for at least 27 seconds (personal communications with plant manager). Figure 1: Simplified diagram of fluid milk sample collection points in the farm and processing plant. Sample points include [A] sampling port at the farm, [B] truck’s tank outlet valve, [C] raw milk tanks, [D and E] immediately before and after HTST pasteurization, [F] pasteurized milk tanks, and [G] packaged product taken from the line right after the filler. Raw and commercially pasteurized milk samples were thoroughly mixed, and 150 mL aliquots were transferred into sterile 250 mL screw-capped bottles. From the samples collected in Spring 2013 [S13], sub-samples of 150 mL of commercially pasteurized milk were also transferred into sterile 250 mL screw-capped bottles. Raw milk and sub-samples of commercially pasteurized milk [S13] were heat-treated in the laboratory at 80°C for 12 minutes to kill vegetative cells and to select for sporeforming bacteria. A water bath was used and samples were treated in groups of five (based on its consistence similarities), along with temperature control. Heat-treated samples were immediately cooled on ice. Commercially pasteurized milk samples or aliquots of thereof, were not submitted to a heat-treatment in the laboratory during Spring 2012 and Fall 2012, assuming that the pasteurization performed by the processing plant would leave a similar bacteria population in the product to those heat-treated in the laboratory [9,10]. However, from the samples collected in Spring 2013, sub-samples of commercially pasteurized milk were heat-treated in the laboratory to evaluate the potential for post-processing contamination on pasteurized samples. Laboratory heat-treated and commercially pasteurized milk samples were maintained under refrigeration (5 ± 1°C) for 21 days to enrich for psychrotrophic sporeformers. The initial microbiological quality of raw and commercially pasteurized milk samples was evaluated according to procedures defined for standard plate count (SPC) and coliform count (CC) in the Standard Methods for the Examination of Dairy Products . Laboratory heat-treated and commercially pasteurized milk samples were maintained under refrigeration and enumerated for mesophilic spore count (MSC) or SPC on days (d) 1, 7, 14 and 21 post-heat-treatment or post-collection, respectively. Samples were plated by serial dilution on Standard Methods Agar (SMA) and when necessary, 1 mL of each milk sample was spread-plated over 4 plates to allow bacterial enumeration in samples with low bacterial counts. Bacterial counts (MSC or SPC) were determined after incubation at 32°C for 48 h . Bacterial colonies present on SMA plates of all laboratory heat-treated and commercially pasteurized milk samples were visually examined, and 1 to 5 colonies with different morphology were isolated and streaked for purity on SMA at each time point. Purified isolates were frozen at -80°C in 15% glycerol for further identification analysis. Isolates obtained from milk samples representing different points of the milk processing supply chain were characterized based on their genotype, either by using rpoB or partial 16S rDNA sequencing. DNA of 207 bacterial isolates was extracted with the QIAmp DNA Mini Kit (Qiagen Inc., Ca). Subtyping was done according to the DNA sequence of a 632 nucleotide fragment of the rpoB gene (9) by using the rpoB PCR primers described previously by Drancourt et al. and the PCR conditions optimized by Durak et al. . All isolates for which the rpoB section was not amplified, they were identified by partial 16S rDNA sequencing. To achieve this, primers PEU7  and DG74  were used to amplify a fragment (~700bp) of the 16S rDNA sequence, following the PCR cycling conditions described by Fromm and Boor . A T100TM Thermal Cycler (Biorad, USA) was used to amplify both the rpoB and 16S rDNA genes. PCR products were evaluated by agarose gel electrophoresis (1% agarose, 60 V for 2 h) and the ones yielding only a single PCR product (with the appropriate base-pair size) were used for further analysis. The PCR products were purified using the QIAquick PCR Purification Kit (Qiagen Inc., Ca) following the kit’s protocol. Purified PCR products were quantified using a NanoDrop ND-1000 spectrophotometer. Purified PCR products were sent for bidirectional sequencing with Big Dye Terminator chemistry at Eurofins MWG Operon. Same PCR primers as described were used for sequencing. DNA sequences were assembled and trimmed to 632-nt rpoB fragments (corresponding to nt 1,455 to 3,086 of the 3,534- nt rpoB open reading frame of B. cereus ATCC 10987; GenBank accession number AE017194, locus tag BCE_0102)  in DNA Baser Sequence Assembler v3.x . Ambiguities were resolved by examination of the chromatograms and only high quality, double-stranded sequence data was used for further analyses. In a similar way, partial 16S rDNA sequences were assembled and trimmed to correspond to a 616-nt fragment (nt 823 to 1438 of the 1,508-nt 16S rDNA gene in B. cereus ATCC 10987; GenBank accession number AE017194, locus tag BCE_5738)  using DNA Baser Sequence Assembler v3.x . The forward and reverse sequences of some isolates showed the presence of two different nucleotides at a specific position due to the presence of multiple copies of rDNA operons with different sequences in a given isolate . Thus, partial 16S rDNA sequences were assembled using nucleotide ambiguity codes as described by the Nomenclature Committee of the International Union of Biochemistry and Molecular Biology. For all analyses, log-transformed bacterial count data were used. Samples from all seasons were organized in three groups: laboratory heat-treated raw milk, in-line commercially pasteurized milk and packaged commercially pasteurized milk. Analysis of variance was done to evaluate the effect of these sample groups on bacterial counts (SPC or MSC) throughout shelf life. One-way ANOVA followed by Tukey’s multiple comparisons test was performed using GraphPad Prism version 6.04 for Windows (GraphPad Software, La Jolla, Ca). Upon receiving of the samples, the SPC of all 16 raw milk samples (farm, trucks and processing plant) were within the regulatory limit (raw milk from one farm < 5 log CFU/mL) established in the PMO , with a mean SPC of 3.15 log CFU/mL (ranging from 2.78 to 3.79 log CFU/mL). Moreover, the mean CC for these samples was 1.44 log CFU/mL, and ranged from 0.85 to 1.97 log CFU/mL. For all seasons, the mean for SPC of 9 commercially pasteurized milk samples collected from in-line locations (after pasteurizer and in tanks) was 1.29 log CFU/mL, and ranged from 0.30 to 1.89 log CFU/mL. The mean for SPC of 6 packaged pasteurized milk samples was 1.74 log CFU/mL, and ranged from 1.11 to 2.31 log CFU/mL. These results are similar to what other studies have obtained in other regions of the US (i.e., Northeast, Southeast, South, Midwest and West) . Furthermore, the majority of pasteurized milk samples did not show presence of coliforms. Only two packaged pasteurized milk samples collected in Spring 2013 had coliforms counts (1.29 and 1.45 log CFU/mL, respectively) above the regulatory limit (<1 log CFU/ mL) established in the PMO (8). These results clearly indicate that post-process contamination is a problem that the US industry still faces, and that can be reduced or eliminated by adhering to proper sanitization and processing practices [2,3,21]. All raw milk samples from all seasons were heat-treated in the laboratory to evaluate their potential contamination with sporeforming bacteria. The MSC of all heat-treated raw milk samples (farm, trucks and plant) and SPC of all commercially pasteurized milk samples throughout refrigerated storage (5 ± 1°C) was obtained and plotted to evaluate changes in bacterial numbers over 21 days of shelf life (Figure 2). MSC or SPC, among the sample groups (laboratory heat-treated, in line commercially pasteurized and packaged commercially pasteurized), were not significantly different (P>0.05; ANOVA) on day 1 (1.40, 1.29 and 1.74 mean log CFU/mL, respectively). Nevertheless, at days 7, 14 and 21, SPC of packaged commercially pasteurized milk (2.48, 4.95 and 7.60 mean log CFU/mL, respectively) were significantly higher (P<0.05; ANOVA) than SPC of in-line commercially pasteurized milk (1.21, 2.46, 4.25 mean log CFU/mL, respectively) and MSC of laboratory heat-treated raw milk (1.37, 1.58, 2.20 mean log CFU/mL, respectively). 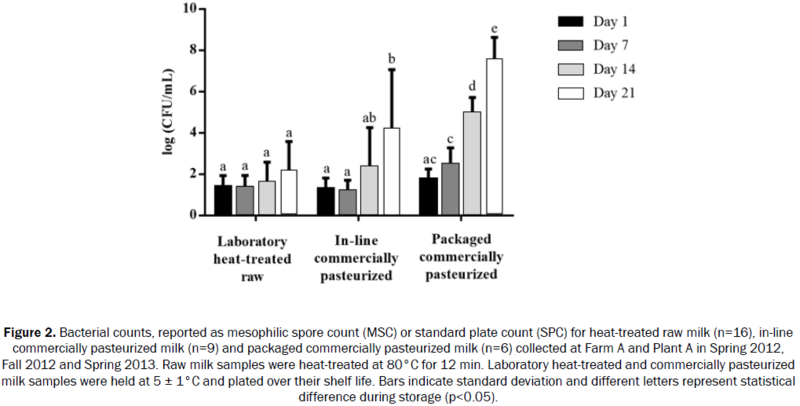 MSC of laboratory heat-treated raw milk samples were not significantly different (P>0.05; ANOVA) throughout shelf life; while a significant increase (P<0.05; ANOVA) in SPC of packaged and in-line commercially pasteurized milk samples was observed by day 14 and day 21, respectively. These results suggest the presence of a different microbial population with varied spoilage potential among these three sets of samples. Figure 2: Bacterial counts, reported as mesophilic spore count (MSC) or standard plate count (SPC) for heat-treated raw milk (n=16), in-line commercially pasteurized milk (n=9) and packaged commercially pasteurized milk (n=6) collected at Farm A and Plant A in Spring 2012, Fall 2012 and Spring 2013. Raw milk samples were heat-treated at 80°C for 12 min. Laboratory heat-treated and commercially pasteurized milk samples were held at 5 ± 1°C and plated over their shelf life. Bars indicate standard deviation and different letters represent statistical difference during storage (p<0.05). At days 1 and 7 post-processing or post-heat-treatment, 100% of the laboratory heat-treated raw and commercially pasteurized milk samples evaluated in this study had counts below the PMO regulatory limit of 4.3 log CFU/mL . Although, a high quality raw milk was supplied for the production of HTST pasteurized milk, none of the packaged commercially pasteurized milk samples reached a shelf life beyond 21 days based on the PMO specifications. After 14 days of storage, 94% of the laboratory heat-treated samples, 100% of the samples right after the pasteurizer, 67% of pasteurized milk in tanks and 17% of packaged pasteurized milk samples had bacterial counts <4.3 log CFU/mL. Indeed, the percentage of milk samples with enumeration below the PMO specification [<4.3 log CFU/mL ] at the end of the shelf life study (21 days) decreased as the product moved throughout the processing. By day 21, 94% of the laboratory heat-treated raw milk, 67% of pasteurized milk right after the pasteurizer, 33% of pasteurized milk in tanks and 0% of packaged commercially met the regulatory limits established by the PMO for pasteurized milk. Therefore plant factors (such as PPC and processing conditions) might have a greater influence on pasteurized milk shelf life than raw milk quality as other studies have indicated [2,21]. In particular, several studies have pointed out PPC as a recurring cause of HTST pasteurized fluid milk spoilage in the US [2,3,21], and bacterial spoilage of pasteurized milk due to PPC has been mainly associated with the filling process . Overall, the results of this study reflects the continuous challenge that many processing plants in the US face to control PPC. Implementing improved pasteurization, sanitization and maintenance protocols as well as properly training employees can contribute to the elimination of PPC in commercially pasteurized milk throughout the processing plant [2,3,21]. Specially, a routine cup maintenance and replacements of the rubber cup portion from each nozzle of the filler at regular intervals, has proven to be a good strategy in reducing PPC during the filling process . A total of 207 isolates were selected from the bacterial count plates (MSC or SPC) from milk samples during its shelf-life [day (d) 1, 7, 14 and 21]. These isolates were identified based on their rpoB or 16S rDNA sequences and included 64 from Spring 2012 (d1=20, d7=16, d14=12 and d21=16), 60 from Fall 2012 (d1=19, d7=9, d14=9 and d21=23) and 83 from Spring 2013 (d1=26, d7=15, d14=15 and d21=27). Among these isolates, only 132 yielded PCR amplicons for the rpoB-gene. The other 75 isolates were identified using a partial section of 16S rDNA. The microbial diversity based on rpoB and partial 16S sequences in laboratory heat-treated raw (LHR), commercially pasteurized (CP) and laboratory heat-treated commercially pasteurized milk (LHCP) for all seasons and time points is presented in Figure 3. The prevalence of each species is expressed in a percentage basis of the number of isolates (n) obtained from samples in each sample group. Because isolates were obtained from samples to represent diversity rather than their true prevalence, the data represented by these pie charts should be interpreted with caution. The prevalence reported by the charts does not directly correlate with the prevalence of the isolates in the bacterial population of raw milk samples; but rather the distribution of isolates, when a wider diversity was sought during isolation. Nonetheless, a high percentage of isolates in all milk samples were identified as Bacillus spp., representing 84%, 54% and 61% of the isolates from laboratory heat-treated raw, commercially pasteurized and laboratory heat-treated commercially pasteurized milk samples, respectively. Similarly, this sporeforming bacteria genus has been identified throughout the farm-to-table continuum by other researchers as previously reported [9,10,20,22]. All sample types showed presence of PaeniBacillus spp. varying from 11 to 29% of the total isolates. This is quite relevant as PaeniBacillus spp. are known for their ability to grow under refrigerated conditions and be responsible for enzymes production that cause fluid milk to spoilage during storage [20,22]. Even though several sporeformers have been previously reported with the ability to grow under low temperature conditions (i.e., PaeniBacillus spp., ViridiBacillus spp., and B. weihenstephanesis, among few others) [3,20]. PaeniBacillus spp. was the most commonly psychrotrophic sporeforming group found on the analyzed samples in the current study. Figure 3: Distribution of Bacillus spp., PaeniBacillus spp., other sporeformers and PPC isolates obtained from laboratory heat-treated raw milk (n=101), commercially pasteurized milk (n=75) and laboratory heat-treated pasteurized milk (n=31) collected from Farm A and Plant A during Spring 2012, Fall 2012 and Spring 2013. Among the commercially pasteurized milk samples, 9 out of 15 were contaminated with psychrotrophic non-sporeforming bacteria due to PPC, accounting for 29% of the isolates collected from this group of samples. Bacterial strains associated with these samples were identified as B. licheniformis (27%), Pseudomonas spp. (11%), PaeniBacillus spp. (9%), B. safensis (8%), and Exiguobacterium spp. (7%). The presence of Pseudomonas genus is an indication of PPC since these organisms are well known to be killed during the pasteurization process. This assessment is substantiated by the results obtained when commercially pasteurized milk samples were heat treated. When isolates from LHR and LHCP samples were selected to represent their microbial diversity, the isolates obtained were exclusively sporeformers such as Bacillus licheniformis (45%), B. safensis (14%) and PaeniBacillus odorifer (6%). During the refrigerated shelf-life study, 25% of LHR, 66% of CP, and 20% of LHCP samples showed a greater than 2 log increase in SPC or MSC during refrigerated storage. These findings indicate that about 20-25% of the raw and processed samples were contaminated with psychrotrophic sporeforming bacteria. Commercially pasteurized samples were also contaminated with sporeformers in addition to other non-sporeforming bacteria (i.e., psychrotrophic gram-negative bacteria). In general, bacterial counts (SPC or MSC) on day 21 were higher for milk samples contaminated with non-sporeforming bacteria than with sporeforming bacteria. In particular, milk samples contaminated with Pseudomonas spp. and Pantoea spp. showed the highest SPC (7.23-8.6 log CFU/mL) on day 21. In contrast, milk samples contaminated exclusively with sporeforming bacteria showed lower bacterial counts (3.26 - 6.30 log CFU/mL) by day 21. These results confirm that gram-negative bacteria grow faster in refrigerated pasteurized milk than sporeforming bacteria, thus disguising the presence of sporeformers at the end of shelf life [3,5]. The microbial diversity of the isolates collected from laboratory heat-treated samples throughout the refrigerated storage is described in Figure 4. Previous studies have reported a shift in the predominant population of sporeforming bacteria from Bacillus spp. to PaeniBacillus spp. during refrigerated storage of heat-treated raw and pasteurized milk [3,19]. This shift is associated with the psychrotrophic characteristics of PaeniBacillus spp. However, in the current study such shift during storage was not observed among the isolates obtained from raw milk samples collected during 2012. This may suggest that these samples were initially contaminated with extremely low levels of psychrotrophic strains. In fact, it is believed that the presence of psychrotolerant sporeforming bacteria in raw milk could be as low as 0.003 - 3.5 CFU/ml . However during 2013, the bacterial population shift from Bacillus spp. and other sporeformers to PaeniBacillus spp. was observed in raw and pasteurized milk samples (Figure 4) . 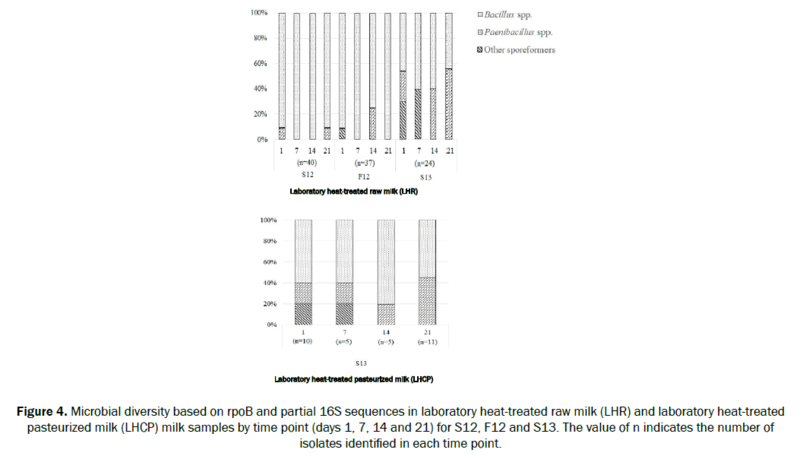 Figure 4: Microbial diversity based on rpoB and partial 16S sequences in laboratory heat-treated raw milk (LHR) and laboratory heat-treated pasteurized milk (LHCP) milk samples by time point (days 1, 7, 14 and 21) for S12, F12 and S13. The value of n indicates the number of isolates identified in each time point. Shelf-life analysis of milk samples suggested that in this particular facility, milk decrease its quality as it moves through the processing chain. This suggests that processing and sanitization procedures are as important as the raw milk quality. Regarding sporeformer bacteria, result showed that 20-25% of the milk samples were contaminated with psychrotrophic sporeformers. Because of their ability to survive pasteurization, as other sporeformers, milk dairy producers and processors need to develop strategies that will lead to the overall reduction of these organisms throughout the processing supply chain. Extending shelf-life of pasteurized fluid milk beyond 21 days depends on advances on this area. Some interventions that could be applied include the use of sand as a bedding material, cleanliness of the udder and its teats, and improved sanitization of milking parlors and processing facilities. This work was supported by the Midwest Dairy Association and American Dairy Association of Nebraska. Authors also thank Quality Management Inc. (QMI) for providing aseptic samplers for the collection of in-line milk samples. The contribution of the owners, managers and employees from the dairy farm and plant in Nebraska are acknowledged. Fromm HI and Boor KJ. Characterization of pasteurized fluid milk shelf-life attributes. J Food Sci. 2004;69:M207-M214. Ranieri ML and Boor KJ. Short communication: Bacterial ecology of high-temperature, short-time pasteurized milk processed in the United States. J Dairy Sci. 2009;92:4833-4840. Trmcic A, et al. A standard bacterial isolate set for research on contemporary dairy spoilage. J Dairy Sci. 2015;98:5806-5817. Ralyea RD, et al. Bacterial tracking in a dairy production system using phenotypic and ribotyping methods. J Food Prot. 1998;61:1336-1340. Durak MZ, et al. Development of molecular typing methods for Bacillus spp. and PaeniBacillus spp. isolated from fluid milk products. J Food Sci. 2006;71:M50-M56. Carey NR, et al. Shelf lives of pasteurized fluid milk products in New York State: A ten-year study. J Food Prot. 2005;25:102-113. Huck JR, et al. Tracking spore-forming bacterial contaminants in fluid milk-processing systems. J Dairy Sci. 2007a90:4872-4883. Huck JR, et al. Molecular subtyping and characterization of psychrotolerant endospore-forming bacteria in two New York State fluid milk processing systems. J Food Prot. 2007b70:2354-2364. Frank JF and Yousef AE. Test for groups of microorganisms. In: HM Wehr, JF Frank (eds. ), Standard Methods for the Examination of Dairy Products (17th edn. ), American Public Health Association, Washington, DC. 2004;227-248. Drancourt M, et al. rpoB gene sequence-based identification of aerobic gram-positive cocci of the genera Streptococcus, Enterococcus, Gemella, Abiotrophia and Granulicatella. J ClinMicrobiol. 2004;42:497-504. Rothman RE, et al. Detection of bacteremia in emergency department patients at risk for infective endocarditis using universal 16S rRNA primers in a decontaminated polymerase chain reaction assay. J Infect Dis. 2002;186:1677-1681. Greisen K, et al. PCR primers and probes for the 16S rRNA gene of most species of pathogenic bacteria, including bacteria found in cerebrospinal fluid. JClinMicrobiol. 1994;32:335-351. Klappenbach JA, et al. Rrndb: The ribosomal RNA operon copy number database. Nucleic Acids Res. 2001;29:181-184. Benson DA, et al. GenBank. Nucleic Acids Res. 2010;38:D46-51. McGinnis S and Madden TL. BLAST: At the core of a powerful and diverse set of sequence analysis tools. Nucleic Acids Res. 2004;32:W20-5. Huck JR, et al. Tracking heat-resistant, cold-thriving fluid milk spoilage bacteria from farm to packaged product. J Dairy Sci. 2008;91:1218-1228. Ivy RA, et al. Identification and characterization of psychrotolerantsporeformers associated with fluid milk production and processing. Appl EnvironMicrobiol. 2012;78:1853-1864. Martin NH, et al. Results from raw milk microbiological tests do not predict the shelf-life performance of commercially pasteurized fluid milk. J Dairy Sci. 2011;94:1211-1222. Martinez BA, et al. Isolation and genetic identification of spore-forming bacteria associated with concentrated-milk processing in Nebraska. J Dairy Sci. 2017;100:919-932. Moatsou G and Moschopoulou E. Microbiology of raw milk. In:BHOzer, G Akdemir-Evrebdilek (eds. ), Dairy Microbiology and Biochemistry. CRC Press Boca Raton, FL. 2014;1-31. MasielloS, et al. Identification of dairy farm management practices associated with the presence of psychrotolerantsporeformers in bulk tank milk. J Dairy Sci. 2014;97:4083-4096.